Near the heart of Central London lies this trendy media-favourite. Surrounded by Euston Road to the north, Oxford Street to the south, Portland Place to the west and Tottenham Court Road to the east is Fitzrovia. It’s a thriving mix of media companies and agencies such as Saatchi and Saatchi and TBWA, and TV and post-production houses such as MTV Networks and Nickelodeon. You’ll find a wide mix here, from large stucco-fronted houses to period townhouses and mansion blocks. New build houses with garages and apartment blocks with penthouse suites can also can be found in this diverse area. To some, Charlotte Street is Fitzrovia. Leading off from Oxford Street, it is an oasis of calm in the midst of Central London. In terms of residential properties, the large stucco-fronted houses surrounding Fitzroy Square and charming, period townhouses located in pedestrianised streets such as Colville and Middleton Place are all highly sought after. Author Ian McEwan not only lives there, but writes about it in his books, and you may spot Lily Allen or TV personality Griff Rhys Jones too. It’s safe to say you’ll be spoilt for choice for things to do and places to go; restaurants range from modern Spanish, French and Italian to Japanese. And as for finding a bar to frequent, you won’t have any problems – we recommend trying Shochu. The area hosts All Souls C of E Primary School – a leading faith school – and St Vincent’s RC School is not too far away in Marylebone. Nestling nicely between the West End and London’s busiest shopping streets, Fitzrovia leaves you in safe hands for transport links. Great Portland Street, Goodge Street, Oxford Circus, Tottenham Court Road, Warren Street and Regent’s Park Underground stations are all nearby. 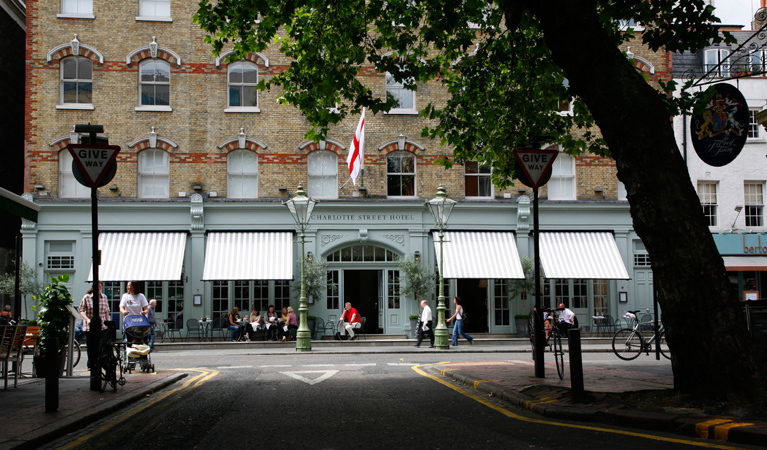 Fitzrovia is said to be named after the Fitzroy Tavern, a public house situated on the corner of Charlotte Street.